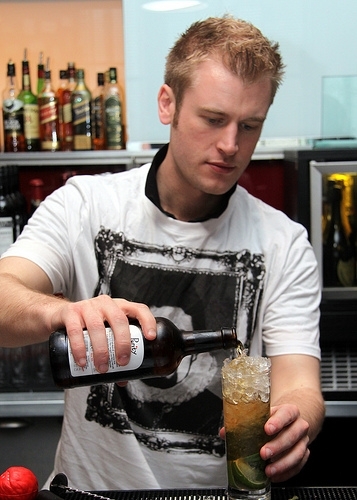 BBC Apprentice finalists make a beer cocktail!! When my fab friend and star of BBC One’s ‘The Apprentice’ , Joy Stefanicki revealed her plans to rope in pals from last year’s show to do something funny for money for RED NOSE DAY, I was chuffed to bits she wanted to include BEER. Last Friday her plans came to fruition when she, Liz Locke, Laura Moore, Chris Bates and Jamie Lester pitched up to the luxurious Malmaison in Birmingham to get tutored by bar manager, Jamie on how to make a variety of special cocktails. WHY? So they could shake the night away for any generous Birmingham drinkers who wanted to donate money to COMIC RELIEF in return for the privilege of one of the TV stars making them a cocktail at the gorgeous Chameleon Bar. 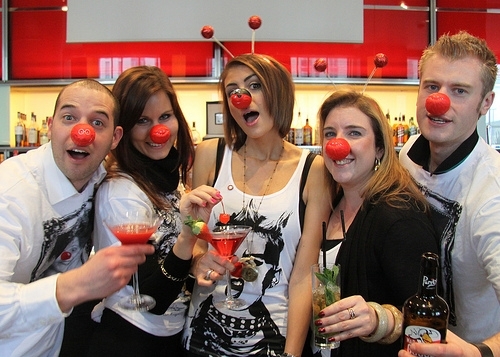 And all the fun on the telly is on RED NOSE DAY which is on Friday March 18th on BBC One. There’s snippets of the guys making cocktails in this video!!!!!! 2 Responses to BBC Apprentice finalists make a beer cocktail!! Well done Marv and friends! 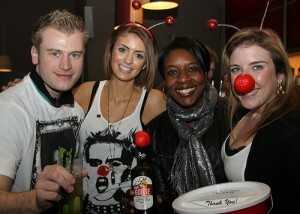 looks like you all worked and played hard for a wonderful cause… bring on the Mad Mojitos!